Recent advances in this technology may help streamline screening and examinations and allow retina specialists to diagnose disease in patients remotely. In learning to accurately diagnose and treat diseases, physicians review large volumes of clinical data, working to absorb the patterns and associations that are hallmarks of those diseases. In a remarkably similar way, but on a staggeringly shorter timeline, machines are being harnessed to do the same through artificial intelligence (AI). AI is the programming of machines to perform complex tasks typically completed by humans, such as predicting, learning, comprehending language, and identifying objects.1 This can be accomplished through a variety of models over a spectrum of complexity. • Artificial intelligence (AI) is the programming of machines to perform complex tasks typically completed by humans, such as predicting, learning, comprehending language, and identifying objects. • Deep learning has become an increasingly popular form of AI because of its potential for superior accuracy, flexibility, and self-improvement. 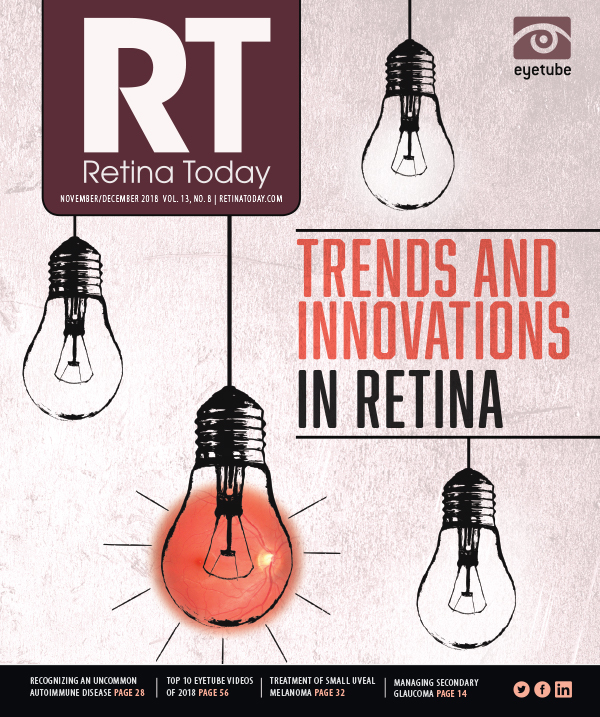 • Automated screening for retinal diagnoses may reduce the number of healthy patients who would otherwise need eye screening in the clinic; it could help to ensure that subspecialists are examining and treating more patients with higher disease burden. • Incorporating AI into the health care system can potentially help provide better access and make physicians more efficient. Now, the field of AI has entered ophthalmology. In April, IDx-DR (IDx Technologies) became the first AI system cleared by the FDA for automated detection of diabetic retinopathy (DR).6 The system analyzes fundus photos captured with the Topcon NW400 (Topcon) robotic fundus camera to make its diagnoses. The diagnostic output is binary: either absence or presence of disease, characterized by more than mild DR. Many of these AI systems boast sensitivity and specificity that rivals the ability of experienced retina specialists. How are they able to achieve such accuracy? Depending on the type of AI model used, there may be a considerable training period. One artificial neural network that was trained to diagnose referable DR with 90% sensitivity and 98% specificity used more than 128,000 fundus photos in its training dataset.21 Retina is an ideal subspecialty to meet this imaging demand and to capitalize on AI for screening, diagnosing, and making clinical recommendations. Fundus photos and OCT images are abundant, allowing training datasets to be built quickly and efficiently. These programs rely on experienced ophthalmologists to read the images remotely, either on call or through a reading center, a task that requires a large amount of manpower. Small teleophthalmology programs are sustainable now, but demand for remote image interpretation is likely to rise with the growth of this field. Automated imaging screening could be used to meet this growing demand. Not only is automated screening more time-efficient, but also some studies have shown automated DR screening to be more cost-effective when compared with manual screening.25,26 AI screening systems are cost-effective options even with lower specificity when compared with manual screening, as automated screening is less costly than a clinic visit. Specificity is an area where AI systems continue to improve, helping to reduce the number of unnecessary additional screenings, whether automated or manual.25 AI-based screening systems can also provide significant advantages for global outreach, especially in remote areas, where access to proper screening may not otherwise be possible or affordable. Overall, the introduction of automated screening for retinal diagnosis may help to reduce the number of healthy patients who would otherwise need a healthy screening eye examination in the clinic. By improving sensitivity and specificity, it should also help to ensure that subspecialists are examining and treating more patients with higher disease burden. Incorporating AI into the health care system can potentially help provide better access and make physicians more efficient. 1. Hamet P, Tremblay J. Artificial intelligence in medicine. Metabolism. 2017;69:S36-S40. 2. LeCun Y, Bengio Y, Hinton, G. Deep learning. Nature. 2015;521(7553):436-444. 3. Cao C, Liu F, Tan H, et al. Deep learning and its applications in biomedicine. Genomics Proteomics Bioinformatics. 2018;16(1):17-32. 4. Lan K, Wang DT, Fong S, Liu LS, Wong KKL, Dey N. A survey of data mining and deep learning in bioinformatics. J Med Syst. 2018;42(8):139. 5. Arterys receives 510(k) clearance for Arterys software for cloud-based medical image visualization and quantification [press release]. Arterys. November 2, 2016. www.prnewswire.com/news-releases/arterys-receives-510k-clearance-for-arterys-software-for-cloud-based-medical-image-visualization-and-quantification-300355923.html?tc=eml_cleartime. Accessed November 20, 2018. 6. FDA permits marketing of IDx-DR for automated detection of diabetic retinopathy in primary care [press release]. IDx Technologies. April 12, 2018. www.eyediagnosis.net/single-post/2018/04/12/FDA-permits-marketing-of-IDx-DR-for-automated-detection-of-diabetic-retinopathy-in-primary-care. Accessed October 23, 2018. 7. Gao X, Lin S, Wong TY. Automatic feature learning to grade nuclear cataracts based on deep learning. IEEE Trans Biomed Eng. 2015;62(11):2693-2701. 8. Li F, Wang Z, Qu G, et al. Automatic differentiation of glaucoma visual field from non-glaucoma visual filed using deep convolutional neural network. BMC Med Imaging. 2018;18(1):35. 9. Lee CS, Baughman DM, Lee AY. Deep learning is effective for classifying normal versus age-related macular degeneration OCT images. Ophthalmology Retina. 2017;1(4):322-327. 10. Treder M, Lauermann JL, Eter N. Automated detection of exudative age-related macular degeneration in spectral domain optical coherence tomography using deep learning. Graefes Arch Clin Exp Ophthalmol. 2018;256(2):259-265. 11. Ataer-Cansizoglu E, Bolon-Canedo V, Campbell JP, et al; i-ROP Research Consortium. Computer-based image analysis for plus disease diagnosis in retinopathy of prematurity: performance of the “i-ROP” system and image features associated with expert diagnosis. Transl Vis Sci Technol. 2015;4(6):5. 12. Sonobe T, Tabuchi H, Ohsugi H, et al. Comparison between support vector machine and deep learning, machine-learning technologies for detecting epiretinal membrane using 3D-OCT [published online ahead of print September 14, 2018]. Int Ophthalmol. 13. Vogl WD, Waldstein SM, Gerendas BS, Schlegl T, Langs G, Schmidt-Erfurth U. Analyzing and predicting visual acuity outcomes of anti-VEGF therapy by a longitudinal mixed effects model of imaging and clinical data. Invest Ophthalmol Vis Sci. 2017;58(10):4173-4181. 14. Aslam TM, Zaki HR, Mahmood S, et al. Use of a neural net to model the impact of optical coherence tomography abnormalities on vision in age‐related macular degeneration. Am J Ophthalmol. 2018;185:94-100. 15. Schmidt-Erfurth U, Bogunovic H, Sadeghipour A, et al. Machine learning to analyze the prognostic value of current imaging biomarkers in neovascular age-related macular degeneration. Ophthalmology Retina. 2018;2(1):24-30. 16. Niu S, de Sisternes L, Chen Q, et al. Fully automated prediction of geographic atrophy growth using quantitative spectral-domain optical coherence tomography biomarkers. Ophthalmology. 2016;123(8):1737-1750. 17. Schmidt-Erfurth U, Waldstein SM, Klimscha S, et al. Prediction of individual disease conversion in early AMD using artificial intelligence. Invest Ophthalmol Vis Sci. 2018;59(8):3199-3208. 18. Bogunovisd H, Montuoro A, Baratsits M, et al. Machine learning of the progression of intermediate age-related macular degeneration based on OCT imaging. Invest Ophthalmol Vis Sci. 2017;58(6):BIO141-BIO150. 19. Bogunović H, Waldstein SM, Schlegl T, et al. Prediction of anti-VEGF treatment requirements in neovascular AMD using a machine learning approach. Invest Ophthalmol Vis Sci. 2017;58(7):3240-3248. 20. Prahs P, Märker D, Mayer C, Helbig H. Deep learning to support therapy decisions for intravitreal injections. Ophthalmologe. 2018;115(9):722-727. 21. Gulshan V, Peng L, Coram M, et al. Development and validation of a deep learning algorithm for detection of diabetic retinopathy in retinal fundus photographs. JAMA. 2016;316(22):2402-2410. 22. Schmidt-Erfurth U, Sadeghipour A, Gerendas, BS, et al. Artificial intelligence in retina [published online ahead of print August 1, 2018]. Prog Retin Eye Res. 23. Channa R, Zafar SN, Canner JK, Harins RS, Schneider EB, Friedman DS. Epidemiology of eye-related emergency department visits. JAMA Ophthalmol. 2016;134(3):312-319. 24. Rathi S, Tsui E, Mehta N, et al. The current state of teleophthalmology in the United States. Ophthalmology. 2017124(12):1729-1734. 25. Tufail A, Rudisill C, Egan C et al. Automated diabetic retinopathy image assessment software: diagnostic accuracy and cost-effectiveness compared with human graders. Ophthalmology. 2017;124(3):343-351. 26. Scotland GS, McNamee P, Fleming AD, et al; Scottish Diabetic Retinopathy Clinical Research Network. Costs and consequences of automated algorithms versus manual grading for the detection of referable diabetic retinopathy. Br J Ophthalmol. 2010;94(6):712-719.